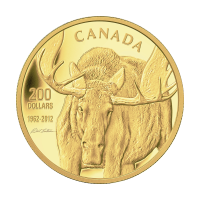 1 oz 2012 $200 Canadian Moose Gold Coin | ?? 正面 Effigy of Queen Elizabeth II and the words "Elizabeth II D.G. Regina"
反面 A close up of Robert Bateman's famous painting of a bull moose.